This week’s Stunning Style highlights some great pieces from Her Universe! Featuring a Star Wars hoodie, Boba Fett top, plus some fan-made Star Destroyer earrings, I consider this my Empire-themed outfit. I’m a huge fan of Her Universe products, so you’ll definitely be seeing other Stunning Style looks using her shirts. This stylish hoodie is one of the first items Her Universe came out with and can still be purchased on their website. 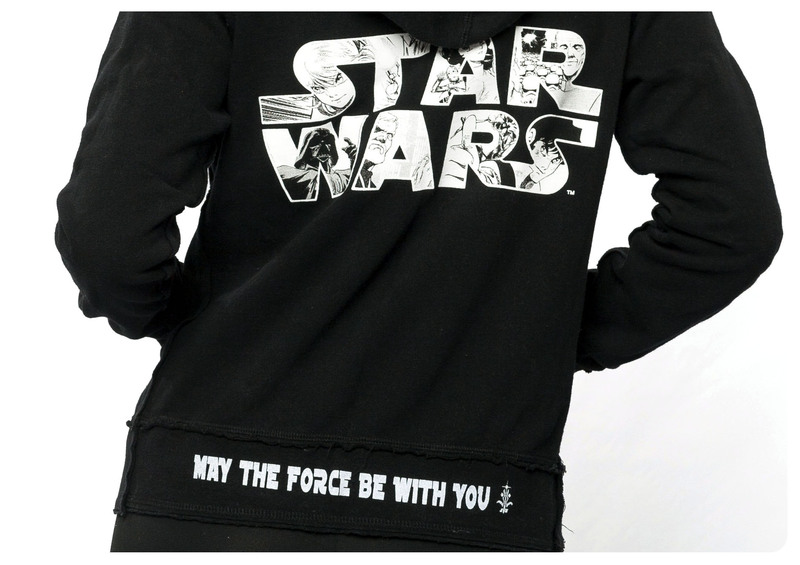 Featuring manga-styled Star Wars images, it’s a unique and incredibly soft and comfortable piece. Perfect for any outfit. 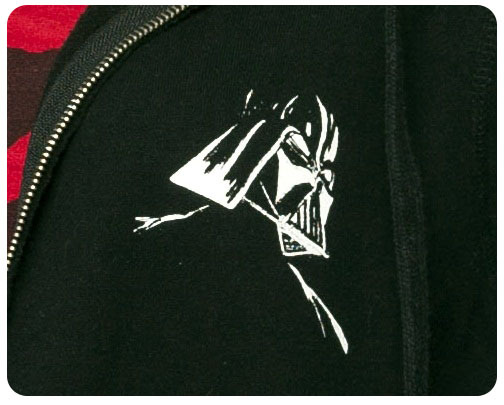 Marc Ecko also came out with a line of Star Wars hoodies. While his products are for men, many females have purchased his hoodies. I adore my Boba Fett hoodie, and it’s oversized fit on me works great as its own “look”. I bought this Mythosaur Skull tank from Her Universe as soon as it became available. Unfortunately it was a Hot Topic exclusive and is currently sold out. 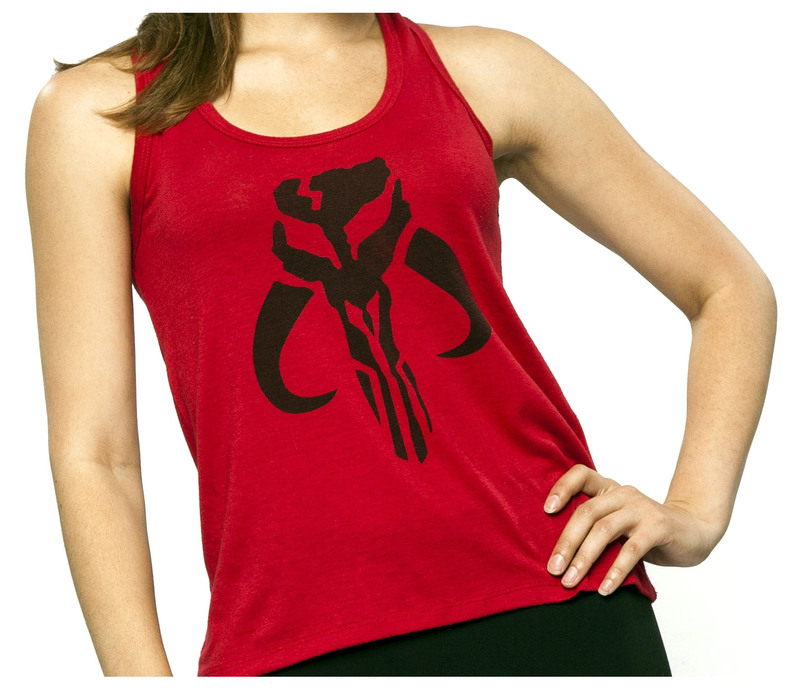 It is still available as a fitted tank top over at ThinkGeek. Make your own! With t-shirt painting DIY’s, the possibilities are endless when it comes to creating chic geek tops. These are my go-to pair of basic black leggings. They are a perfect and simple piece to any outfit, and can help change things up if you want to wear something other than jeans. I kept it simple and went with a pair of basic black boots. Something slightly similar to Imperial Officer boots, but with more heel. If you don’t like wearing heels, or can’t where them for long periods of time, flat or low-heeled boots are always a great alternative and really add nice style to any outfit. 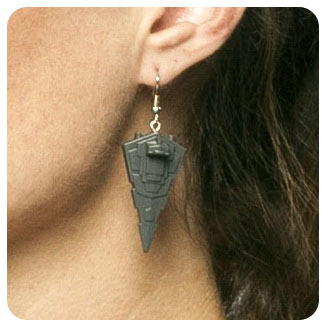 Star Destroyer earrings! You can get a pair here on Etsy. I love these earrings. They’re incredibly geeky, but due to their plain color and small size, they are a great addition to any outfit without being overbearing. Next week we’ll be featuring a new Stunning Style look from Lindz! We love the looks some of you have shared with us on our Facebook Page. They’ve all been unique, awesome, and totally inspiring! Please feel free to share with us geek chic looks from you or others, DIYs, or any awesome geeky items you see in stores. I love love LOVE Her Universe, and Ashley is just so sweet. Really great article! And I love the earings, I have a pair of lighsaber earings :-).